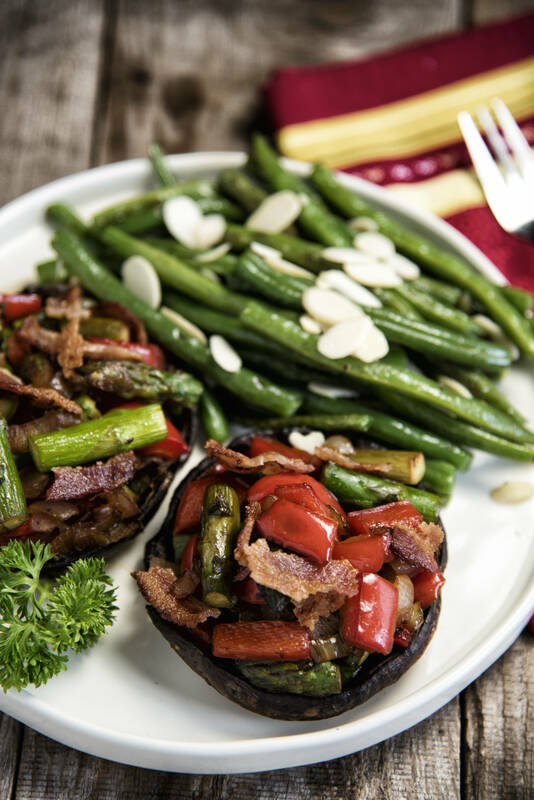 Stuffed portobellos are always on our “to eat” list. First of all, mushrooms are the perfect Paleo food – they can be grown or wild harvested and they have been around since the beginning of time. Can’t get more prehistoric than that! Secondly, along with massive amounts of antioxidants loaded into each mushroom, there are so many kinds to choose from. Lastly, texture is definitely not lacking, nor is the range of flavor from species to species. Diversity is king in the fungi world, but today we’ll stick to portobellos, because they are prefect for stuffing. The act of consuming mushrooms is a time-honored way of getting non-animal-based proteins into your diet, and it is a good way to add essential vitamins and minerals when you take the initiative to push grains off your plate. In fact, there isn’t even anything very mysterious about a portobello – it is just a very mature white button mushroom, that is it, nothing more. Perhaps the greatest thing about mushrooms is that they can be added to soups, stir-fries, casseroles and salads, and as we’ve already proclaimed, stuffed is the way to go. Sausage-stuffed button mushrooms, anyone? They make the perfect little appetizer. As this dish is a complete meal on its own, there is no need to create a complementary side dish, though if it feels that a sweet aftertaste is missing from your menu, let us suggest an ambercup coconut milk dessert. It does complete the meal nicely. Remove mushroom stems and spoon out the gills (brown part under the cap). Combine all the ingredients for marinade. Mix well. In a large bowl or bag, put in the mushroom caps and cover with marinade. Allow to sit for 10 minutes. Place oven rack in the center of oven and preheat to 400 F.
In a large skillet, fry the bacon. Once finished, remove and cut into pieces. In the same skillet over medium heat, add asparagus, pepper and onion. Sauté for a few minutes and then add the chicken stock. Bring to a boil, then reduce heat to low. Continue to cook until broth has been absorbed. Place the marinated mushroom caps on a baking sheet. Fill each cap with the vegetable mixture. Put in oven and cook for 20 minutes. For green beans: Cook green beans in boiling water for approximately 5 minutes. Strain and return to stove-top in a large skillet. Add olive oil and cooking fat, then season to taste. Mix the green beans until all are coated. Continue cooking for 2 to 5 minutes. Serve with slivered almonds over the dish.